Morning transfer to the airport to connect the flight to Bagdogra . On reaching Bagdogra we will be received by the botany expert who will accompany us for rest of the tour in Sikkim and Darjeeling. 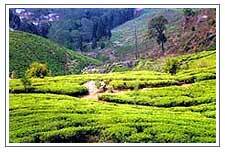 Bagdogra to Darjeeling is a three hours drive uphill through tea gardens and small towns. We will occasionally meet the famous Darjeeling toy train, huffing and puffing across our road. Early morning visit Tiger Hill for fabulous sunrise views of Mt.Kanchenjunga , the third highest mountain in the world at 28,156 ft. Mt. Everest and a host of other Himalayan giants are also seen on the horizon. On our drive back to the hotel we will stop at Ghoom , a Tibetan-Buddhist monastery. After breakfast we shall visit the old botanical gardens to see their collection of rare orchids and other plants. After lunch visit the Himalayan Mountaineering Institute, the Tibetan Refugee Camp and the local market. Evening we will have a lecture by Prof. Pradhan or Prof. Chettri from the Botany Dept. of the local University, on the flora of Darjeeling and surrounding areas. Today's' drive is truly a naturalist's delight. The hillsides and mountain slopes of Sikkim are strewn with bright patches of myriad colors. The lower mountain slopes are abundant with lush green bamboo and ferns. The northern valleys are draped with wild cherry, oaks, chestnut, pines as well as magnolia variety's called Magnolia Campbeli and Michelia Doltso-pa. The higher altitudes are abloom with 46 species of Rhododendrons. And of course, Sikkim's 600 varieties of orchids are everywhere. This day our 05-hour drive is interesting as we move upstream along the river Rangit through dense forests of sal and teak. Over night will be in a government-run tourist lodge called Mount Pandim, situated on top of a hill at the altitude of 7000 feet. From your bedroom windows you can see the magnificent Kanchenjunga massif which is only 35 miles away as the crow flies. Early morning after having our breakfast we walk to the Pemayangste monastery which is only a km from the hotel. Here we hear the chanting of the morning prayers by the young and old monks and the smell of the burning Juniferous Squamata and Rhododendron Nivele. Pemayangste , also known as the "Perfect Sublime Lotus ", is one of the oldest monasteries of Sikkim and belongs to the Red Hat sect of Tibetan Buddhists. After visiting this monastery we will drive towards Kecheopalri Lake. After a walk around this "wishing lake ", a short trek downhill towards Yuksum. We will see some common wild orchids like the Dendrobium. This night we will be camping and our food will be cooked by our own staff who will be serving Sikkim specialties along with the famous local brew called the "Tongba". The original capital of Sikkim , the tiny hill town of Yuksum is the base for treks and climbing expeditions to Mount Kanchenjunga and other important peaks. This day we walk to the coronation throne, Dubdi Monastery and the nearby jungles to see wild orchids like the Coelogyne and Dendrobium , as well as the indigenous flora of Sikkim. The 5-hour drive from Yuksum to Gangtok passes lush green fields the famous large Sikkimese Cardamoms as well as Golden Rice. Perched atop a ridge at a height of 1520-m. lies Gangtok, a quaint, colorful town. This small-modernized town is the capital of Sikkim. 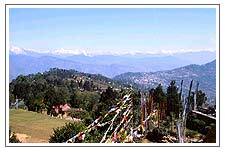 Here we visit the famous monastery of Rumtek which is the head quarters of the Kagyu sect. Later, we visit the Institute of Tibetology which has a collection of almost 30,000 volumes on diverse subjects like astrology, philosophy, magic and religion. After lunch we visit the Orchid Sanctuary which has over 200 species of temperate and intermediate orchids on beautifully landscaped grounds. Our next stop is the Epica gardens, which has large collection of indigenous plants of Sikkim. Evening we will have a discussion with local botanists Prof.Tamang, Mr.Lachungpa and Mr.Gurung. This day we visit Shingba Rhododendron sanctuary set at 12000 ft. Here we find different varieties of Rhododendrons like the Triflorum, Hodgsonii, Dalhousiae, Cilatum, Cinnbarinum, Campanulatum etc. Besides this we find several pine families like the Cedrus Deodara, Abies Spectabilis, Tsuga Dumosa, Pinus Wallichiana etc. Of course, the sanctuary is also very rich with alpine flowers like Rheum Nobile, Rheum Australe etc. Yumthang is also rich in sulphur springs and even the kings of Sikkim have made their own bathing huts. The air starts to get cooler as you enter the valley, with towering peaks closing in from all sides. From this point Tibet is only 25 kms as the crow flies. Evening return back to our lodge in Lachung. The 5 hours drive from Gangtok to Bagdogra follows the Teesta river and we will be making stops to see the low altitude Himalayan flora. Arrive Delhi in the early evening. Day at leisure. Departure transfer to the airport for the flight back .